BlogsDon’t Waste That Energy. Put It To Work. While considering the harvesting of energy and resources from within the waste stream flow of a WRRF as being essential to achieving energy independence, optimizing the process to lower energy loads significantly contribute to achieving those energy goals. Energy that is scavenged beyond the WRRF waste stream can also contribute to lowering the facility’s energy requirements and further reduces dependency on conventional electrical sources. Next to aeration, sludge disposal is one of the largest expenses in a conventional WWTP. The use of thermal energy is a common technique to effectively accomplish sludge volume reduction as well as create a usable Class A product for land application. The sun is a tremendous source of free energy. Solar energy can be harvested in a couple different ways to provide most, if not all of the energy required to accomplish sludge volume reduction and a Class A product. One method is utilized by placing dewatered sludge into a greenhouse. In the greenhouse’s constructed environment, the sludge is evenly distributed on the greenhouse floor with an automated turning mechanism. The interior climate is controlled through circulation fans and venting, allowing for effective moisture evaporation. Surprisingly, this solution can be employed in a variety of locations, including more northern latitudes. Drying is accomplished by understanding and controlling time-temperature relationships of the thermal energy exposure to the targeted sludge in the greenhouse. By understanding the solar index of a given location, the size and the capacity of the greenhouse structure can be determined. In Bayreuth, Germany, the sludge-drying greenhouse located there augments the solar heating capacity by accessing waste heat from a nearby biogas plant. The thermal energy is applied through radiators located above the sludge bed and is distributed by ventilation fans that are used in the solar drying and waste heat operations. Although solar greenhouses for drying sludge provide an excellent example of the ability to reduce sludge volumes using scavenged thermal energy from the sun, WRRF effluent and external waste heat sources, it is not a panacea. Since the system is largely dependent on the amount of solar energy available, the size of the facility’s footprint becomes larger as the solar index lowers. 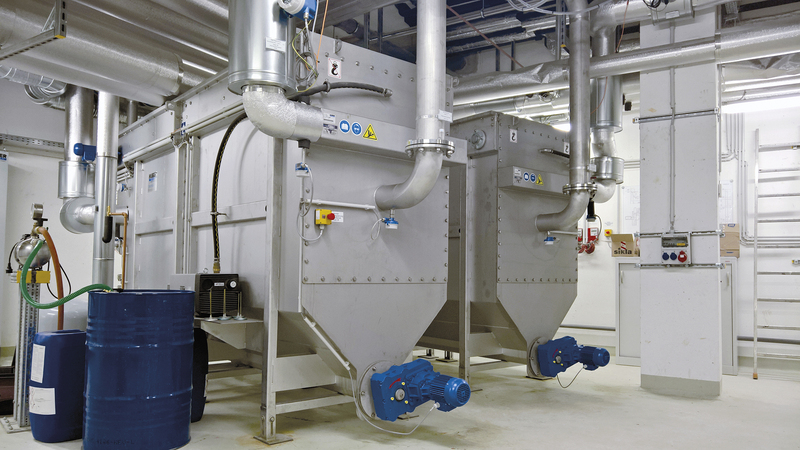 With the introduction of low-threshold-temperature belt dryers, the technology opened up the opportunity to safely access waste heat sources such as cogeneration facilities, kilns, biogas plants or any other thermal intensive processes. The physical size range of the belt dryers makes it practical to locate the drying facility in close proximity to the energy source. Interesting combinations of waste heat utilization were used at the Innsbrucker Wastewater Treatment Plant in Austria. The facility was able to place a belt dryer in an existing structure. Heat to operate the dryer is extracted from exhaust heat from the generators at the biogas operation. Waste heat from the dryer itself is used to contribute to the facility’s heating and finally distributed further in a district heating grid to heat the Olympic swimming pool and nearby restaurant at the former Olympic Village. The use of scavenged energy and waste heat sources to reduce sludge volumes are proving to be effective tools in creating energy self-sufficiency in the WRRF. The wastewater stream that flows through the facility still conveys and discharges a tremendous source of low-grade thermal energy. Because wastewater is collected in a centralized network of sewer pipes in populated regions, it is possible through the use of self-cleaning heat exchangers to access and use the wastewater as a sizeable quasi-geothermal source for heating and cooling buildings. A recent example of this was accomplished at the American Geophysical Union headquarters building in Washington, D.C., where they were successful in accessing a major sewer line in front of the building and providing heating and cooling of the building using wastewater as the primary source. As this application begins to expand, utilities are actively interested in tapping the Btu resource in the collected wastewater and metering to heating districts, to provide an additional source of revenue. So-called “waste” thermal energy provides viable in-roads for WRRFs on the path to achieving net-zero and net-positive objectives. As research and technology advances it will become increasingly feasible and practical to access other forms of energy latent in the wastewater flow passing through the plant. In a workshop conducted by the NSF/DOE/EPA three areas of focus were identified in WRRFs as possible sources of energy: 1) thermal, 2) chemical, and 3) hydraulic. Biochemical energy sources are currently in use in the digestion processes and the production of biogas in a WRRF. Breakthroughs in the practical application of bioelectrical systems such as microbial fuel cells or microbial electrolysis cells provide a clue of what the future may bring.